Below follow links to the clubs quarterly newsletter, The "Yankee Chatter"
If you have any previous newsletters that aren't listed in our archives we would like to get copies so we can post them. please use contact page and forward what you may have or we can set up way to copy older Chatters. Are you interested in becoming a member? 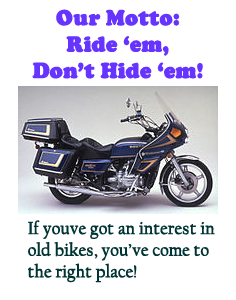 You must first be a member of our national club the Antique motorcycle Club of America.